Crafts and creations from the girl with no fingers! The wonders of Washi Tape! I have been a big fan of washi tape for a good while now but I’ve never been very adventurous. I’ve just used it with my papercraft projects such as cards and a scrapbook I did for a friend. However I was browsing Pinterest, as I so often do, and I found someone on there who had revamped some furniture using it. I have a table that I use as a bed-side table at night and in the living room during the day so it gets a lot of use out of it and it was very, very boring. So I decided to washi it! It was really, really easy. I gave it a good wipe down and wiped it dry. Then just grabbed the washi tape and started applying. I’d bought a multi-pack of 10 solid coloured washi tape from http://www.washitapes.co.uk and initially I was going to just use those in a pattern but after much discussion with my sister (as is essential with these things! ), I got out the existing tapes I had which were all patterns and then put one stripe of pattern every three solid colours. It worked really well and makes it a bit more interesting without it being gaudy. Just to finish it my Mum got some old B&Q varnish out the garage and gave it two coats, leaving it to dry in the garden. I’m really proud of it! Here’s a photo of my sister and I’s handy work! 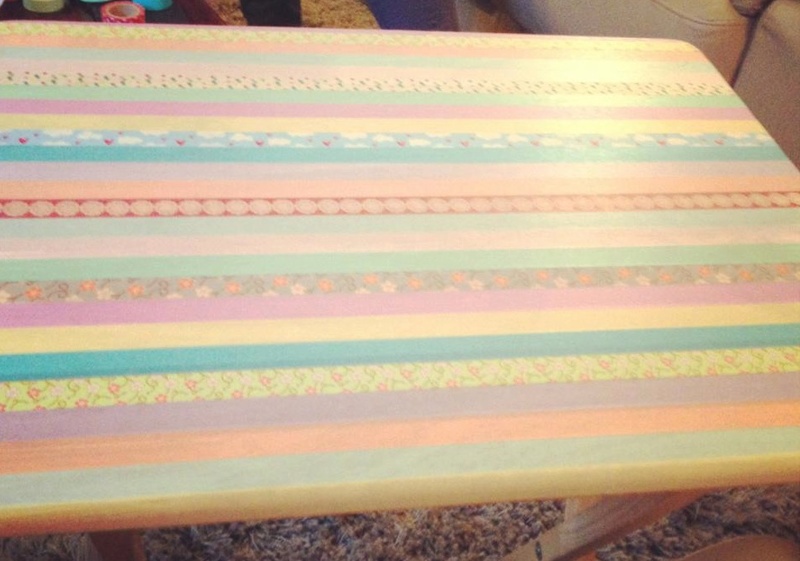 This entry was posted in Craft and tagged craft, diy, ikea hack, table, upcycle, washi tape. Bookmark the permalink.